I've never thought of myself as having really bad skin. I'd say it was generally okay, but like a lot of people, every so often it freaks out. And when it does, it's bad. For the past 8 weeks or so, my skin has been awful. What started out as a couple of spots turned into a major breakout from my jawline to my cheekbones. I still can't pinpoint what caused it, but I think it's either been hormonal or a reaction to some product I've used. Recently I was contacted by Yuu Beauty in Glasgow, who very kindly invited me into the salon to review one of their treatments. The offer couldn't have came at a better time and I was really hoping this would be the turning point in beating my skin problems. As if to rise to the challenge, my breakout continued to get worse and worse until the day of the appointment. When I met Leeane at the reception, I felt like my make-up free skin was shouting 'help me!'. The salon itself was gorgeous inside - really clean and fresh looking and since it's below ground level, it has a really calm atmosphere that you'd never expect with a busy city centre outside. Leeane sat down with me and we talked about my skin concerns and due to my active breakouts, we both agreed the Acne Facial would be the best bet for me. The treatment lasted one hour and I have to say, I don't think I've ever been so relaxed. I was feeling quite stressed that day, and even then I still managed to fall asleep a few times! The treatment used a variety of Elements products. One was quite a grainy exfoliator that was left on for 15 minutes. Another was a warm, waxy balm that had a menthol scent - I was warned before that this might sting a little at first (which it did) but after the first few minutes, it settled and I think I drifted off again. I wasn't expecting instant results, so I was really surprised to notice such a difference in my skin straight after the treatment. It felt softer, smoother and any breakouts that I felt were 'waiting' under my skin felt like they'd calmed down. I made a promise to myself to stay make-up free for the next few days to give my skin time to continue the recovery and now, two weeks on, my skin is almost completely back to normal.I definitely feel like this was this treatment was the turning point. Leeane told me that they normally recommend 3-4 sessions to get the full effect, so I'm going to go for at least one more before Christmas time. I'd highly recommend Yuu Beauty for anyone in the Glasgow or Edinburgh area. If you want to try out the acne facial, it's currently on offer until the end of the year. 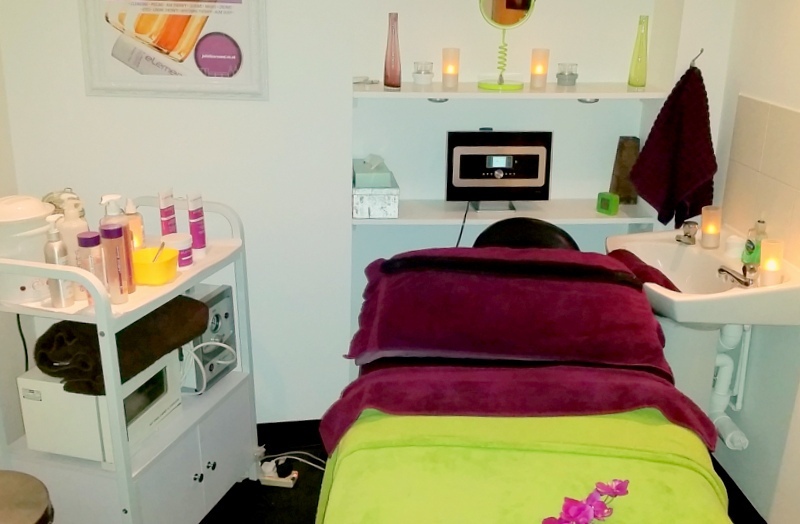 For the one hour treatment, you'll pay £35 instead of £45, which is a really good price for a quality facial. Thank you so much to the salon for inviting me in and giving me such a lovely treatment! Have any of you ever been for a facial? Do you have any tips for bad breakouts? p.s follow me on bloglovin here! 1 comment on "Beauty | Yuu Beauty Acne Facial "